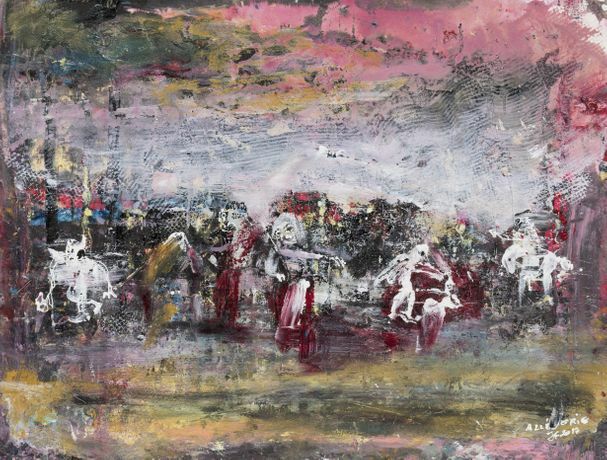 This spring sees the long-awaited UK showing of Belgian artist Julien Friedler. Consisting of 40 intimate works on paper, it is the first significant outing for the Belgian artist in the country and an introduction to Friedler’s intriguing body of work. Well known across Europe and the US, Friedler’s work defies the surface activity found in much contemporary art. His works – which include paintings, drawings, writings as well as events – are informed by mythology: of spirits and mystical entities like angels and demons within ethereal universes. Both contemplative and exuberant, they are replete with tensions between space and solidity. They reward slow reflection. An ex-psychoanalyst – and a long-time pupil of Jacques Lacan – Friedler has long studied mythology and anthropology, and brings these ideas to his work. He has a worldwide association called the Spirit of Boz, which aims to establish exchanges and links with a global community. Inaugurated in 2006, the Tour of Boz is to operate for 80 years, bringing the Spirit of Boz to the world. It is in the tradition of culture exchanges of Robert Rauschenberg and Fluxus – using the power of art as a catalyst for global interaction – and now updated as a source of communion in the internet age.